In 2003, recognizing the company's long history of service, quality, and innovation in specialty niche steel markets, Blue Blade Steel bought the Benedict-Miller company. Since the purchase, Benedict-Miller, LLC has focused on supplying Aircraft Quality grades 4130 and 4340 sheet, plate, and bar materials and now offers one of the world's largest DFARS compliant inventory of these grades. Capitalizing on strengths in engineering and knowledge of their customer needs the company has added value with continued investment in cutting and finishing equipment. Take a few minutes and tour our sister company's facilities through the most recent video focusing on value-added processing and support operations. Or click here to go visit the Benedict Miller website. 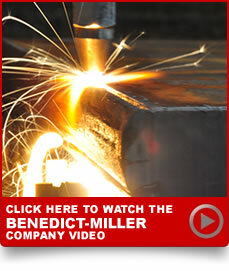 Explore Plasma & Flame Cutting, Blanchard Grinding, Annealing, Saw Cutting, Shearing, and other material handling capabilities at Benedict Miller Steel. Explore synergies and new product lines we now offer that might create further depth to our partnership.